Ready for a Style Steal? Last month I missed this feature for no reason in particular, so as soon as I spotted two of my favourite bloggers wearing this colour combination for Ada's birthday party earlier this month I knew I had to try and emulate both their styles. Yes two styles, I'm trying to make up for last months missing post! So do you know who's style I have copied this month? If you've seen either of these bloggers you'll understand just why I wanted to steal from them. 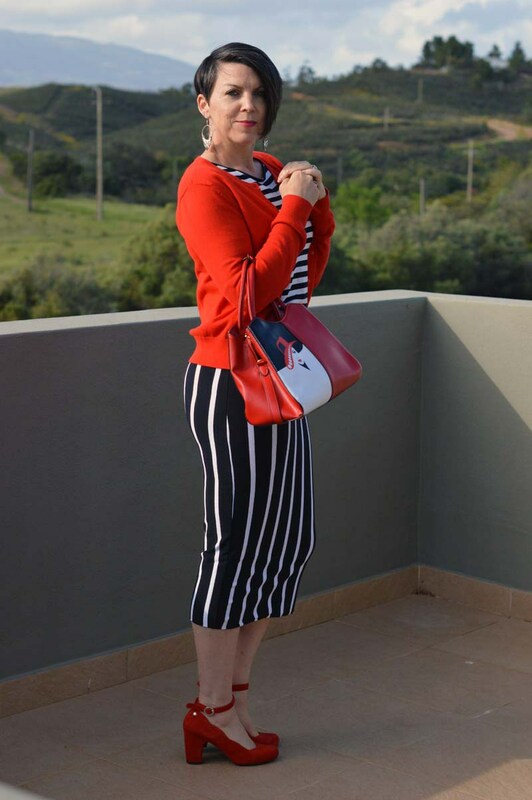 I've followed Suzy Turner for some time now, I adore her fun loving, young at heart outfits, that always have a quirky edge to them, normally in the bags she matches to an outfit. You'll also find her on You Tube sharing her love of hair cuts! More importantly she's a writer so she wears it well and writes it even better. Now let me introduce Nancy, find more about her love of fashion and what's trending over on her blog space Nancy's Fashion Style. With her never failing supply of stunning outfits, I'm a huge fan and always see styles I want to copy - having already stolen this grey & mustard ensemble from her I hope she doesn't send the police after me!!!! My outfit came together by chance. I was chatting to my youngest daughter and noticed this long blouse on her bed - 'light bulb moment' and the outfit was born. I've worn this stretchy stripy dress last year, so this was the base. 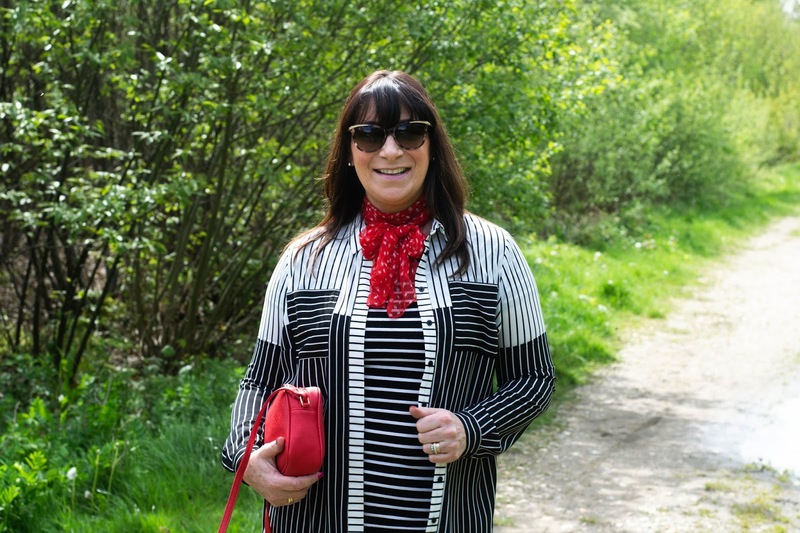 I layered my daughters stripy blouse over it to resemble a jacket, topped off with my spotty scarf, red bag (also my daughters) and my red shoes that really should be relegated to the charity bin - but hey ho until I get a new pair they took their position in my Style Steal line up and completed my look. We had plenty of laughs taking these photos, trying to dodge the dog walkers whilst changing and taking care not to slip in the woods - now wouldn't that have been funny if I did! Does this remind anyone else of a piano keyboard? Although I can't play the piano I think I play this style very well! Lol! So glad you stopped by today - did I get the 'Steal' right? Esther Ruby took my delightful photos again - hasn't she done a superb job? It's a fabulous inspiration from both women, and you wear it perfectly, Jacqui!! Jacqui, you look absolutely gorgeous! And thank you so much for 'stealing' from me and featuring me LOL!! I love that you shared both mine and Nancy's outfits because of their similarities. This is such a FUN post. I LOVE it! Sending the police after you? I want to hug you!😀😀😀 Thank you very much dearest Jacqui. 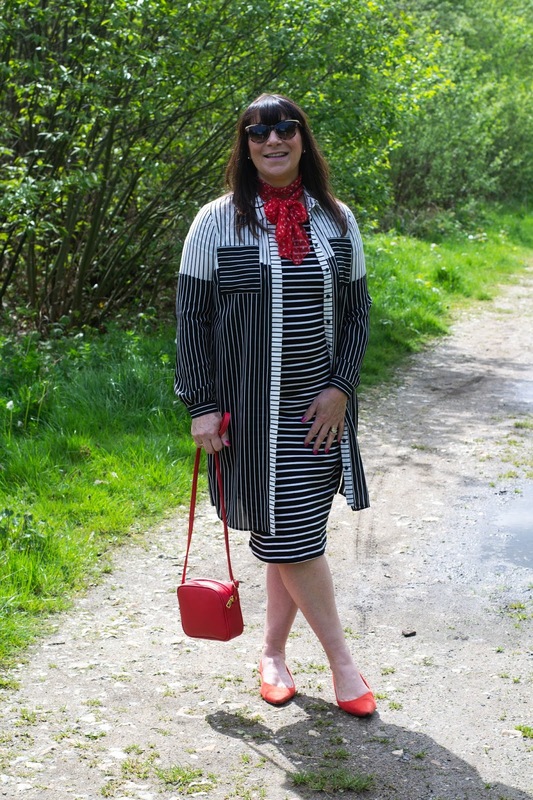 You look fabulous in your stripped black white and red outfit! Spot on. Or stripes on. Black and red are a great classic. Suzy and Nancy look great... love those stripes. I LOVE this outfit! Such a fun way to incorporate stripes! you nailed it! I am really loving this wonderful style on you. While it is inspired by these other great bloggers, this style is completely your own. 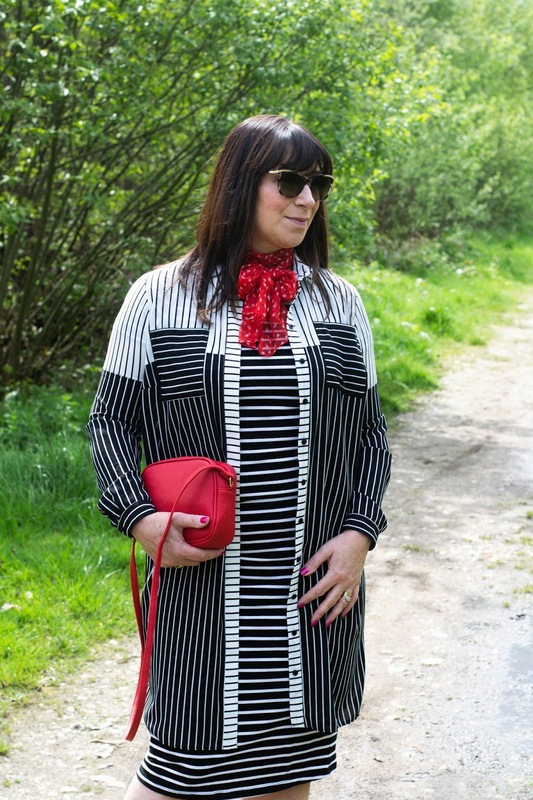 I love the mixed stripes and the red scarf . Thank you so much Elle, such kind comments. Such a striking statement look! 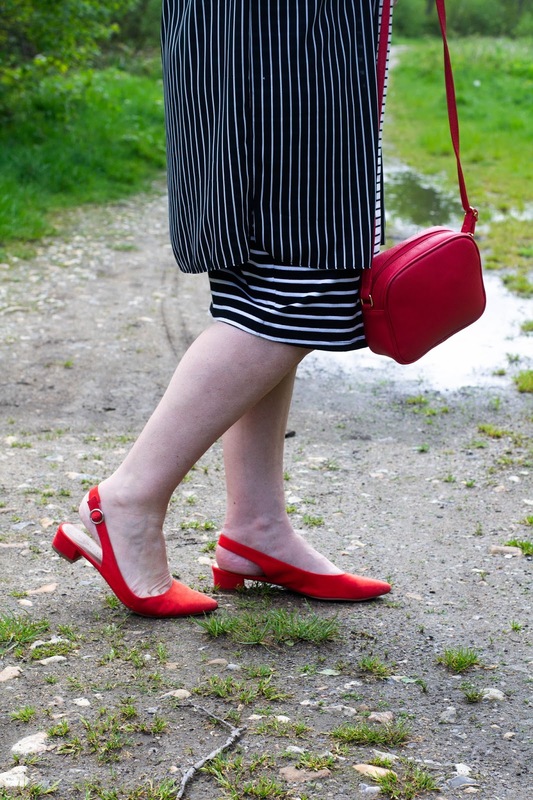 Love the mix of stripes and the pops of red. 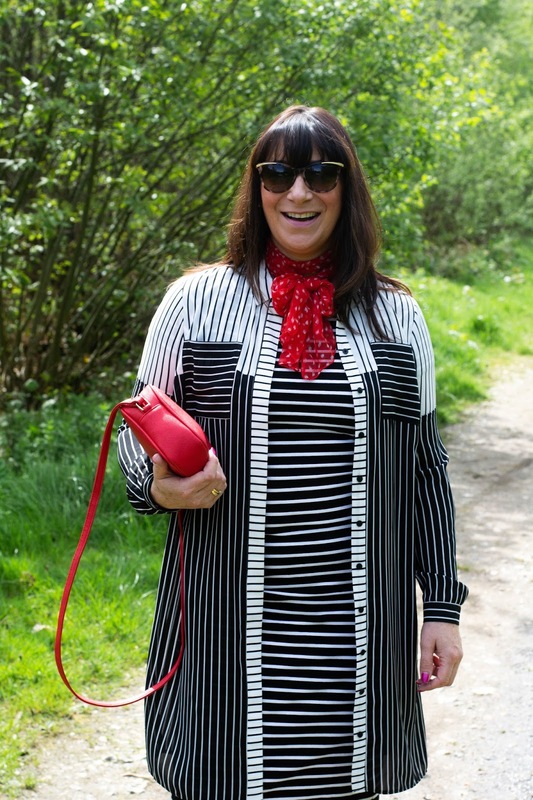 I love the double stripes Jacqui! Black and white with red accents is such a good combination! Thanks for linking up! Aw thanks Emma, I'm pleased with how this turned out.